A well-titled album for Hunter does indeed set down some good grooves on this post hard-bop disc. The drummer, who studied with the late Grady Tate and went on to earn his Masters at Julliard under Carl Allen, spent three years as a member of the Kenny Garrett Quintet as well as performing with such heavies as Lou Donaldson, Curtis Fuller, Javon Jackson and Eric Reed. Pianist Reed is on the album and plays magnificently. The opening track, Blue Chopsticks, composed by Herbie Nichols has Reed paying tribute to Nichols, who died of Leukemia in 1963. Like so many great artists in whatever field, Nichols' true status was only acknowledged after his death and even now, I don't think he's had a mention in the DownBeat Hall of Fame. On Reed's showing here, he [Reed] might get there first. There's also some nice piano on 3 tracks by Sanders. Guitarist Stryker, who co-produced the album with Hunter and is releasing it on his own Strikezone label (May 4), is featured on Stevie Wonder's That Girl and Gary McFarlane's Sack of Dreams; further proof that Hunter didn't want any passengers on board. Eddie Henderson and Donald Harrison make cameo appearances and bring back a few memories. Henderson played with The Cookers at Sage Gateshead a couple of times over the past 2/3 years whilst I have the feeling that Harrison was here with Art Blakey a long time further back. Neither of them has lost it with the passage of time. Harrison's alto solo on 'Trane's Countdown displays a command of his instrument comparable with that of the composer's. Stacy Dillard blows tenor like Armageddon is approaching but the real star is Hunter. Not just as a drummer, or even co-producer but as a composer and arranger. An album well worth checking out. It actually arrived with 4 other CDs - they will have to take their chance in the stockpile lottery. 1/ Blue Chopsticks, 2/ The Big Push. 3/ Autumn. 4/ That Girl. 5/ My Love. 6/ Sack Full of Dreams. 7/ I Remember When. 8/ Countdown. 9/ Give Thanks. Available on Strikezone 8816 from May 4. 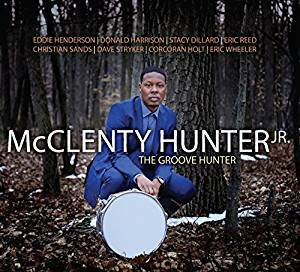 McLenty Hunter Jr. (drums); Eric Reed (piano); Corcoran Holt (bass) + Stacy Dillard (tenor); Eddie Henderson (trumpet - 2); Donald Harrison (alto - 2, 8); Dave Stryker (guitar - 4, 6); Eric Wheeler (bass - 4,6,7); Christian Sanders (piano/Rhodes - 4,6,7).